India's latest crackdown on black money is turning out to be a nightmare for the poor and the middle class. Three days after 500 ($7) and 1,000 rupee notes were withdrawn as part of anti-corruption measures, hordes of panicky people are thronging banks and ATMS to deposit expired money and withdraw lower denominations to run their lives. The queues are getting longer and angrier, and despite the government's loud promises, banks and ATMs are quickly running out of cash. Limits on cash withdrawals are not helping matters much. There are stories of desperate people burning sacks of illegal cash and of people unable to pay for cremations and hospital admissions. Wherever I go - my workplace, the community park, the local market- people are fretting over ways to get some of their own hard-earned money to run their lives. A kind neighbour swiped his card to take 400 rupees out of a groaning cash machine and give it to me when he saw my crestfallen face after the machine rejected my card. Friends and co-workers are generously lending from their own limited stocks of small cash. After several unsuccessful visits to overcrowded banks and empty cash machines, many ordinary people are living on a wing and a prayer. Outside the chaos inflicted upon honest, tax-paying and low-income Indians, a burlesque of sorts is playing out as others try to game the system and convert hordes of scrapped illegal cash into gold and goods, which they can then hoard or sell. For a country inured to corruption and illegal money, there's no dearth of ideas. A salesman of a shop selling mobile phones in an upscale Delhi suburb told me that a man walked up to his shop on Wednesday with 3 million rupees in cash and offered to buy up his entire stock of iPhones. (He said the owner balked, and shut shop.) A politician in Bihar walked into a jewellery shop and bought gold ornaments worth 20 million rupees. In Kolkata, a dengue patient reportedly settled his 40,000 rupees hospital bills in coins. There is also what is being called a thriving 'discount scam': people are offering to buy stocks of scrapped notes at a premium, before laundering the expired money. A builder in the capital has apparently paid his daily wage workers two years of advance salaries with the expired cash, leaving his workers to exchange the money. Relatives with expired money at home are calling friends and relatives and asking if they can deposit some of their money into their accounts. Then there's my favourite story of a doctor who had some cash at home which he planned to turn over to the bank, and then discovered to his dismay that his wife had squirreled away six times the amount in her cupboard. These are desperate times which require desperate measures. Last week, the central bank assured Indians that production of new notes had been "ramped up" to meet requirement, but banks are running out of cash very quickly. What is happening in far-flung villages at this point is anybody's guess. If the banks are unable to ease cash supplies soon, the reported goodwill for prime minister Narendra Modi's so-called game-changing, path-breaking crackdown on illegal - or black - money could easily lead to an angry backlash. What is being also described as his political masterstroke - key state elections in Punjab and Uttar Pradesh are due early next year and his government's "war on black money" could be an effective campaign slogan - could also backfire. At the root of this chaos is the fact that India is an overwhelmingly paper currency country: some 90% of the transactions are done with cash. India's cash-to-GDP ratio is 12%, some four times that of Brazil, Mexico and South Africa. 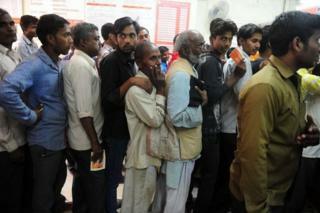 More than half of Indians still don't have a bank account, and some 300 million have no government identification. The two scrapped denominations - 500 and 1,000 rupees - account for more than 85% of the value of cash in circulation. Some of the cash is stashed and transacted in what is a booming "black economy" to evade taxes - politicians, property developers and dealers, traders, doctors, lawyers and sundry white-collar professionals are some of the biggest hoarders. A lot of the illegal cash is actually held in assets - real estate, jewellery - and in banks outside the country. The size of India's shadow economy is estimated at more than 20% of its GDP, and nobody quite knows how much of it is in cash and assets. However millions of low income working class people, poor and roadside small businesses and traders hoard cash because they need the liquidity to run their lives and also, because there is no bank where they live. Supporters of the move say Indians will suffer some short-term disruption to make a dent in the shadow economy, but many are asking why the honest taxpayer and the poor should suffer most. Demonetisation of currency - India's third after two previous exercises in 1946 and 1978 - has predictably turned into an administrative nightmare, as a commentator feared, in a country with a strained state and creaky services. It has also opened a Pandora's box, bringing out the worst - and occasionally, the best - in Indians. It also reminds me of Groucho Marx, who said, "While money can't buy happiness, it certainly lets you choose your own form of misery."